Welcome! Here are some step-by-step instructions on getting the most out of Advanced Java Game Programming. The table of contents and a sample chapter are available from the publisher website. The book is available in paperback or as a downloadable PDF file. Subscribe to the announcements mailing list. I will use this list to announce errata, supplemental online articles, new classes, new multimedia files, and new example games. I will only be sending out a few messages to this list each year. You can subscribe via the announcements mailing list webpage. As errors in the book are identified by myself or readers, I will update the errata webpage and post a message to the announcements mailing list. Please review the errata webpage now to see a list of errors that were identified before you joined the announcements mailing list. If you would like to report an error in the book or suggest an improvement, please post a message to the reader discussion mailing list. The Java APIs and the CroftSoft Code Library continue to improve. Please see the updates webpage. Read the Introduction and Chapter 1. Many readers will want to start programming their own games right away by adapting the template example game described at the end of the first chapter. You can also download the archive from the publisher website. If you want the very latest version of the code, including changes that were made after the book went to print, you can download a compressed archive or get CVS server update instructions from the CroftSoft Code Library web page. Using CVS is described in Appendix B of the book. Compile and play the example games. As described in Chapter 1, an Ant build file and the multimedia files required for the build are included in the source code zip file. The example games are also distributed pre-compiled for user installation as part of the CroftSoft Collection. The Checklist is an online supplement to the book which describes the step-by-step process I use to write an interactive animated Java game or simulation. The example games are based upon a highly reusable library of classes optimized for Swing-based animation. You will need to refer to the javadoc frequently if you want to reuse these infrastructure classes for your own games. The com.croftsoft.apps javadoc covers the example completed game applications plus shorter examples of particular techniques that you can compile and run. The com.croftsoft.core javadoc covers the highly reusable core library including the Swing animation engine classes. Subscribe to the discussion mailing list. 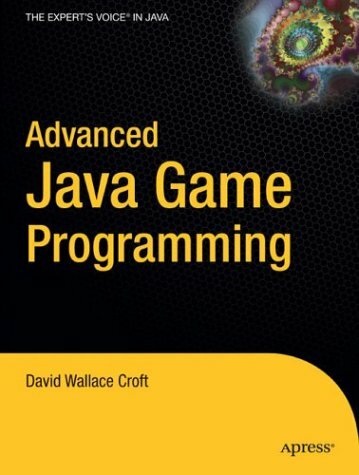 If you have a question about the book or you need help with Java game programming in general, you can contact me via the reader discussion mailing list. I or one of the other list members will answer your question as soon as we can. You can also use this list to identify errors in the book or suggest improvements. You can subscribe via the discussion mailing list webpage. The Public Domain graphics and audio files used in the game examples are included within the source code archive. They are also available for separate download as part of the CroftSoft Audio and Graphics Collections. Please see the CroftSoft Media web page for more information. From my game development course web page, you can download a syllabus and lecture slides which track the chapters in the book. The syllabus and lecture slides are available for reuse and modification under the terms of the Creative Commons Attribution License. The syllabus contains recommended student exercises and projects. The course web page links to deployed projects created by students who have taken my course in previous semesters. Please also see the Java Game Teachers mailing list.